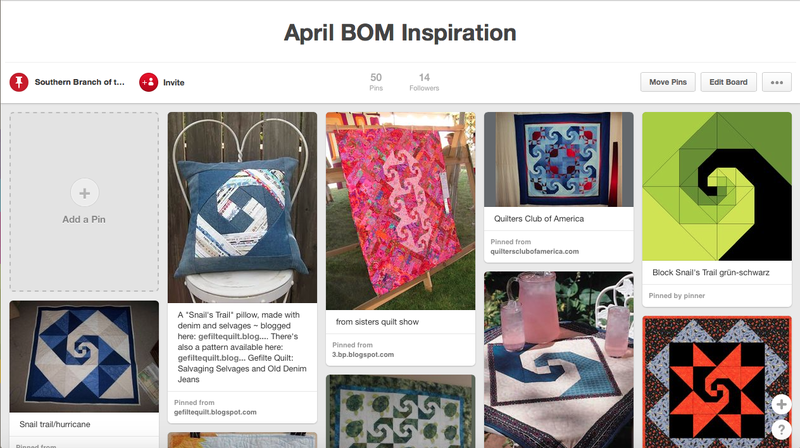 Don’t Forget about our Pinterest Website! Stuck in a rut with your quilting? Did you enjoy making the block from the block of the month? Don’t forget to check out our Pinterest website! We’ve got boards over there for each of our Blocks of the Month, and of our recent demonstrations/speakers! I’ve spent some time this morning finding some tutorials about improvisational piecing if you were inspired by Sandra Jensen’s talk at the last meeting! And look at all these interesting quilts using April’s Block! 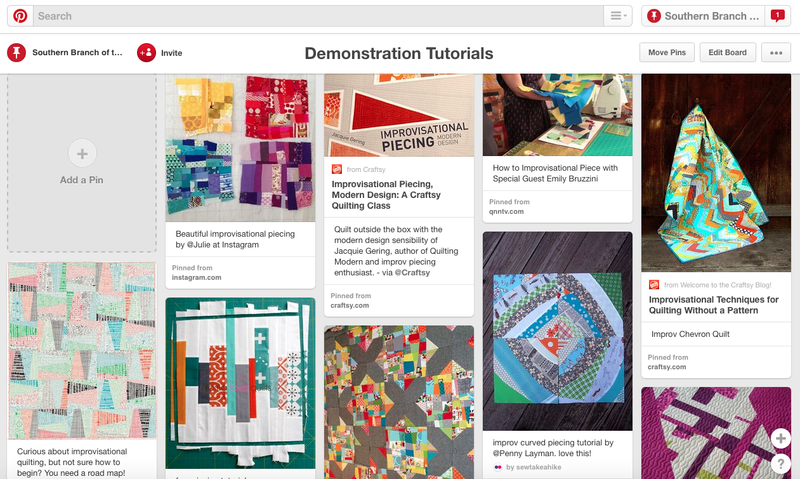 Let us know if you’d like to see anything else on the Pinterest website! Today was our April meeting, as well as our AGM. What a meeting! Our AGM started with our Chair’s report, where Jane recapped the past year, and thanked the members that gave her assistance through the year. Next, Tracy read the minutes of the previous AGM, and then Eilis gave her treasurer’s report. At this meeting, it was announced that Eilis would step down as treasurer and Olivia would step down as Branch representative. Volunteers were requested to join the committee this year, as next year 4 members of the committee would be stepping down. See Jane or any other members of the committee if you’re interested in volunteering! Motions that passed included increasing the fee at the door in order for us to cover room rental fees and a motion to present to the Executive AGM focusing on education for branches. Once all the business was completed, we had our Show and Tell! How about these quilts! Next, Sandra Jansen gave a talk on her quilting history and improvisational piecing. Below is a slideshow of her work she showed the group! Due to the length of the meeting, the Block of the Month instruction was delayed until next month, where we’ll be having a social meeting. Be sure to work on your nearly finished quilts to bring to the Show and Tell. We’re hoping it will be the biggest Show and Tell of the year! We are gearing up for next meeting on SATURDAY 11th APRIL at 10 am. Please do not let the fact that this is also our AGM fool you into thinking that this meeting will be less than fun! It still has lots to offer with a Speaker, Block of the month, Raffle and more! – see below. And don’t forget to sign up for the Irene MacWilliams workshop(s) in June; spaces are limited and filling up fast. Two of our committee members have served their term and we would love to welcome new members onto the committee – no pressure! – we’re a lovely bunch and the more the merrier. We have been so fortunate this month with many courses, workshops and weekends away in the Cork ‘Quiltiverse’, that I hope we have lots to Show and Tell! If, God forbid, any of these masterpieces are not quite finished, panic not….we are having a ‘Social Meeting’ in May with extended Show and Tell. This month is our AGM. This will only be part of the meeting, so please do come along. Anyone wishing to stand for the committee, or nominate someone to stand will be most welcome. 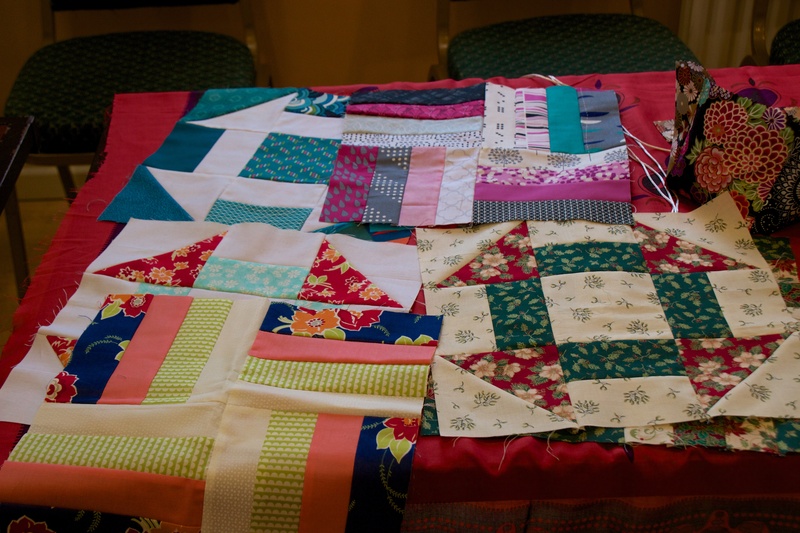 There will be our usual SHOW AND TELL – please log your quilts with Eilish. As usual we can all help ourselves to tea and coffee – please put away your own mugs……oh yes, and bring cake! European Quilt Association Exhibition at Festival of Quilts 2015, “MUSIC… with a touch of red”. Details and application form in the Autumn Newsletter. June 13th Meeting : Irene MacWilliam comes to the Southern Branch! Irene will be our speaker in June and will also be giving not ONE but TWO workshops that weekend. Information and signup sheets available at the meeting. Summer Challenge will be unveiled at the May meeting…watch this space! At our March meeting, we debuted the second block for the Block of the Month project, the Churn Dash! In this photo you can see examples of two of the blocks we’ve debuted, the Rail Fence and the Churn Dash. In six months, we’ll be posting the directions for making the blocks, so be on the lookout in September!